On January 15, 2009, the world was mesmerized by "the miracle on the Hudson.” Against all odds, Captain Chesley B. "Sully” Sullenberger safely landed a plane plunging toward disaster on the river. More amazingly, all 150 passengers survived—and, for the most part, with nothing worse (physically) than a few bruises and soggy clothes. At the time, many of us tried to imagine how we would have those three chilling words—"Brace for impact”—and then, amazingly, been spared from certain death? A year later, it's time for a different, perhaps more meaningful story. What happened to these extremely fortunate passengers when they went home? What was it like to return to their families, their jobs, their neighborhoods—everything familiar, but somehow changed? How did they celebrate coming back from the brink of near-death trauma? How did their loved ones respond to the living proof of a miracle? What has been the real impact they braced for, not of the disaster and death they expected, but of the gift of a "new” life? Intrigued by these and other questions, authors Dorothy Firman and Kevin Quirk set out to find answers—by asking the survivors themselves. The result is an inspiring collection of first-person accounts: Brace For Impact: "Miracle on the Hudson” Survivors Share Their Stories of Near Death and Hope for New Life (HCI Books). Along with the personal stories of 25 men and women profoundly affected by Flight 1549—survivors and first-responders—this volume offers lessons about faith, gratitude, wisdom, healing, love, and transformation for everyone in today's world of upheaval and challenges. Readers will hear from parents who believed they would never see their teenagers, toddlers, or a child on the way; an ex-Marine officer, a swimming pool serviceman, a nurse, a TV executive, and a boat pilot; survivors who have publicly spoken about their experiences at churches, schools, businesses, and organizations as large as the American Red Cross, as well as those who have remained private. Through their heartfelt, stirring words, their courageous admissions of fear, their humor and their hope, the contributors reinforce the importance of family, knowing what really matters, and discovering our purpose. Throughout and above all, Brace For Impact stands as a testament to how something good—even something wonderful—can emerge out of crisis and tragedy. And that's a timely, welcome lesson to inspire and comfort everyone. Dorothy Firman is the New York Times bestselling co-author of Chicken Soup for the Mother and Daughter Soul, among numerous books. She has worked in the field of psychology and counseling for over thirty years. Kevin Quirk is a former journalist with The Charlotte Observer, among other newspapers, and a prolific ghostwriter and editor. Presidential Candidate says: "Dump the garbage into the East River"
"DUMP THE GARBAGE INTO THE EAST RIVER!" Facing rising rents, Michael F. Ingbar, a gallery owner, native New Yorker, Vietnam War Vet, competitive dancer, and addicted windsurfer, is being forced to close the doors of his Soho gallery after 30 years in business. Rather than retire, Michael is trading in canvas for canvassing and has registered as a write-in candidate for President. "In a campaign season marked by limited choices, Americans are desperate for more options to vote with their heart. I hope my campaign will appeal to those disaffected struggling to find hope in our failing political system." Michael hopes his long shot bid will help garner support needed (1% of registered voters) to form a new political party he calls the "Dance Party". Similar to other fringe parties in the state such as the "Rent Is Too Damn High Party", the "Dance Party" will aim to better represent the concerns of Americans. The party's revolutionary platform (a dance floor) will look to give voters new hope and positivity in politics. One of the more radical tenets of Michael's platform is total world disarmament and the resolution of conflict through dance competitions. "Dance is a universal language that is perfectly suited to non-violent conflict resolution," Ingbar said. "From Tango to Twerk, Swing to Shuffle, Ballet to Belly dance, and Hip-hop to Hustle, dances from all cultures will bring us together without violence. We'll turn the floor of the UN General Assembly into a dance hall!" The official start of Michael's campaign on September 8th will coincide with the both the first opening of his gallery's grand final show aptly named - "The Michael Ingbar Gallery Final Show" as well as the beginning of the NDC (National Dance Party Convention). When asked about the purpose of his final show, Ingbar said, "We're having a big sale of art work amassed over my long career and worth more than $400,000, to raise awareness and support for my campaign. Also, I don't think I'll have room to hang everything in the White House." Works on sale will start as low as $1.00 for invitations from old exhibitions to $12,000.00 for a rare Richard Haas etching of the Brooklyn Bridge. Guests at the exclusive opening will be treated to Michael's first official speech as a candidate, in which he'll lay out his entire Presidential platform, including his plan for his first thirty days in office. "I tend to mumble when I talk so people just don't understand me. Therefore I say, 'If you don't know what I'm saying how can I lie to you?'" "Back in 1968, after my Honorable Discharge from the U.S. Army, I created the Peace Sign American flag in protest of the Vietnam War. Within thirty days of taking office, I will present Congress with a plan to change the flag, this time officially. First, we'll replace the stars - far too sharp and aggressive - with oranges. Fifty oranges will be surrounded by five smaller oranges, symbolizing the states and giving representation to the five permanently inhabited and under-represented territories of the United States (Puerto Rico, U.S. Virgin Islands, Guam, Northern Mariana Islands, and American Samoa). A single rotten orange will sit dead center to represent, of course, Washington D.C. I will also change the colors of the stripes. As used in our flag, the color red represents blood that's been shed in our many wars, while white is a symbol of racism. 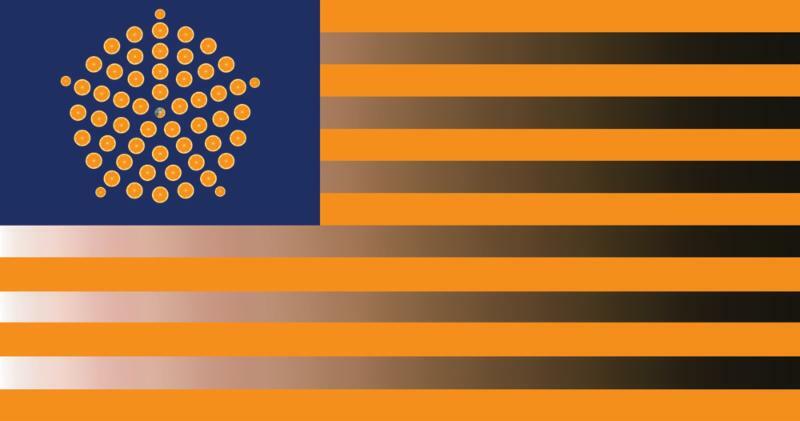 We will replace the blood red with orange, a color named after a fruit as American as apple pie! The white will be replaced with a spectrum of skin-tones to represent the plurality of ethnicities in our country." Sign the petition to change the flag at Change.org. The third and final opening will be on November 9, the day after Election day, with a concession speech planned far in advance! "The Michael Ingbar Gallery Final Show"
Each event will feature live music, dance competitions, refreshments, and of course orange juice. Looking for a quick and delicious lunch? Osteria La Madia (59 W. Grand Ave, Chicago; 312-329-0400) in the heart of River North is the perfect stop for your lunch hour. offers a fresh, seasonal lunch menu that will satisfy every food lover. The Prix Fixe lunch is a great deal. To start, select the soup of the day or the Little Gem Salad with chicken, market tomatoes, crispy pancetta and mustard dressing. Then, take your pick of any of Osteria La Madia's pizzas, pastas, panini or entrée salads for your second course. Enjoy a classic pasta like the Tagliatelle All'Amatriciana with Guanciale, one of the famous wood-fired pizzas such as the Smoked pork belly with Tuscan Kale, or keep it simple with a traditional Italian Grilled Prosciutto Cotto and Provole panini. This two course lunch is only $12. Lunch is served Monday-Friday 11am-3pm. If you can't make it in for lunch, you're in luck because Osteria La Madia offers a Prix Fixe brunch as well. Choose from the sweets or antipasti for your first course and then add any entrée or pizza for $19. Make the deal even better with Prosecco or a bellini for $25. Sweet choices include the acclaimed Firecakes donuts or the scrumptious housemade Brioche Cinnamon Roll-or keep it lighter with Prosciutto and Local Melon. Then, enjoy favorites like the House-Smoked Sockeye Salmon Benedict served with Ciabatta and Hollandaise or one of Osteria La Madia's signature breakfast pizzas, such as the Fingerling Potato and Egg pizza. Osteria La Madia's prix fixe menus offer a offers a great way to enjoy several delicious dishes at this inspired Italian eatery. For reservations, visit http://osterialamadia.com or call 312-329-0400. Osteria La Madia is where two pleasures-great food and distinctive, delicious wines-come together. It is an urban Italian osteria that pays homage to traditional Italian cuisine, featuring house made pastas, anti pasti, salumi and prosciutto, formaggio, salads, and a full entrée selection. The robust wine list features more than 75 wines by the glass, a handsome bottled wine collection and some very crafty cocktails. Mondays, Two for One Pizza: Every Monday, all day, guests can order any two pizzas on the menu and the lower priced pizza will be complimentary. Monday-Friday, Happy Hour: Featuring a 5 for $5 menu, offered from 4:30 to 6:30 p.m. in the bar/lounge area. This happy hour menu features five of Chef Fox's exclusive Neapolitan-style pizzetta creations and a delicious house selection of five wine and beer choices, each for $5. Every Day After 9, Half-Price Pasta: Every night for its late-night diners seated after 9 p.m.
Every Day, Wine Special: $6 for the wine of the week. Fans of Osteria La Madia's pizza are never disappointed. The award-winning fired-roasted selections were developed as a result of chef/owner Jonathan Fox tasting dozens of styles of pizza in the U.S. and Europe. Chef Fox put his own spin on this most elemental of dishes and the results are outstanding. Osteria La Madia's menu is designed for sharing, with flavor-packed, wood-fired pizzas that change seasonally, inventive salads, and savory pasta dishes. Desserts are all made on premises, in keeping with what is seasonally available. When friends ask you to suggest a sleek yet comfortable place for a relaxed meal, Osteria La Madia will be your first choice. Delivery orders may be made on line at: http://osterialamadia.com or by calling 312-329-0400. The moment you've been waiting for is here! We're proud to announce the first film selections headed to Chicago in October. From new work by master filmmakers to emerging new voices, it's going to be another banner year of movies, conversations and more. Our first announcement of films is just the beginning! Keep an eye out for more films in the coming weeks, and join us Monday, September 19 for our Festival Preview Party. Get the scoop on our complete lineup, buy your passes and make your plans for October. The video for “Kids” was shot in one take around Mexico City; including shots of the Angel of Independence, Soumaya Museum, Bellas Artes Palace and the Monument to the Revolution. A3D 360-degree version of the video, created with the Nokia OZO, will be available soon. Watch Part I of the OneRepublic ‘KIDS’ story now. Ironside Bar & Galley – a neighborhood sports bar in River North complete with Chicago crafted bar food with an emphasis on seafood and scratch-made food and craft beverages – will open to the public at 4pm on Wednesday, August 31 at 546 North Wells Street in the former Cyrano's Farm Kitchen space. Ironside owner-operator Jon Mossberger and his business partner in Ironside, Steve Mayer, also own and operate Flagship Tavern & Grill in Lakeview. Scott Horwitch – former general manager of The Underground – and Dustin Berk – former operations manager at 8 Hospitality Group (which includes Hubbard Inn, Barn & Company, LA Social, etc) – are partners in the Ironside project as well. Ironside – whose name derives from the nickname of the U.S.S. Constitution “Old Ironsides” – will have the look and feel of a ship turned upside down achieved by rolled steel ceilings and reclaimed dark wooden beams. Architect Nick Hadley of Arch-H and interior designer Sara A. Kirshner crafted Ironside’s interior to be more industrial than overtly nautical. Steampunk accents include a custom steel bar top and metal piping that accent the bars; bespoke touches like imported shipyard rope walls and dark reclaimed wood are woven throughout the space; and pops of color dot the interior like red damask wallpaper, distressed American flags, murals from Chicago artists, and vintage photographs. Ironside’s layout includes a large main floor with a separate ten-person private dining rom. An intimate basement bar area (dubbed “The Hull”) seats 50 people. Twenty-three flatscreen televisions span the two floors of Ironside. There will also be an outdoor sidewalk patio café with 40 seats. Jim August – also the executive chef at Flagship– will helm the Ironside kitchen. Chef August’s menu at Ironside will be split between crafted Amercian bar food and seafood dishes. Crafted Chicago bar food offerings include Lollipop Chicken Wings with choice of root beer-chipotle BBQ or Buffalo sauces; The Ironside Burger with aged cheddar cheese, smoked bacon, Parmesan-crusted red onion rings, roasted tomatoes & house ketchup; French Onion Soup Grilled Cheese with Gruyère cheese and caramelized onions on grilled sourdough with onion soup dipping sauce; and TJ’s Mac ‘N’ Cheese base off an original recipe from Thomas Jefferson. *Professional photos of some food dishes are available. Full food and beverage menus will be available early next week. Ironside will feature 16 draft lines and will be pouring Chicago favorites like Pipeworks, Midwestern favorites like Three Floyds, and West Coast favorites like AleSmith. Ironside will also feature 33 craft bottle and can beers on its opening menu. About 75 percent of Ironside’s draft, bottle, and can beer will be from the Chicago and other Midwestern breweries while the other 25 percent will be from craft breweries elsewhere in the United States. Ironside will feature eight specialty cocktails that will all cost $12 each. Cocktails range from summery with the “Brosé Rosé” (White Girl Rosé, Gancia Americano, simple syrup, fresh lemon juice, Tropical Red Bull, pineapple garnish), to beer-based with the “Summer Handy” (New Amsterdam Citron vodka, plum-apricot syrup, pineapple juice, lime juice, lemonade, Miller High Life, lemon garnish), to strong & stirred with the “Grab Rails” (Templeton Rye whiskey, Cocchi Americano, Vecchio Amaro Del Capo, Bigallet China-China Amer, orange swath garnish). Ironside will feature a global wine list with 15 wines available by the glass. Frist-tier wines by the glass will be $10 each. Second-tier wines by the glass will be $14 each. Four Champagnes by the bottle are also available. Ironside’s operating hours are 4pm until 2am Monday thru Friday, 11am until 3am Saturdays, and 11am until 2am Sundays.